Everton were reduced down to 10 men in the 25th minute after Josh Hosie was shown a straight red for a late tackle on Ramazani. They held out manfully until 5 mins from the end when Michael Collins gave away a penalty that was duly converted. 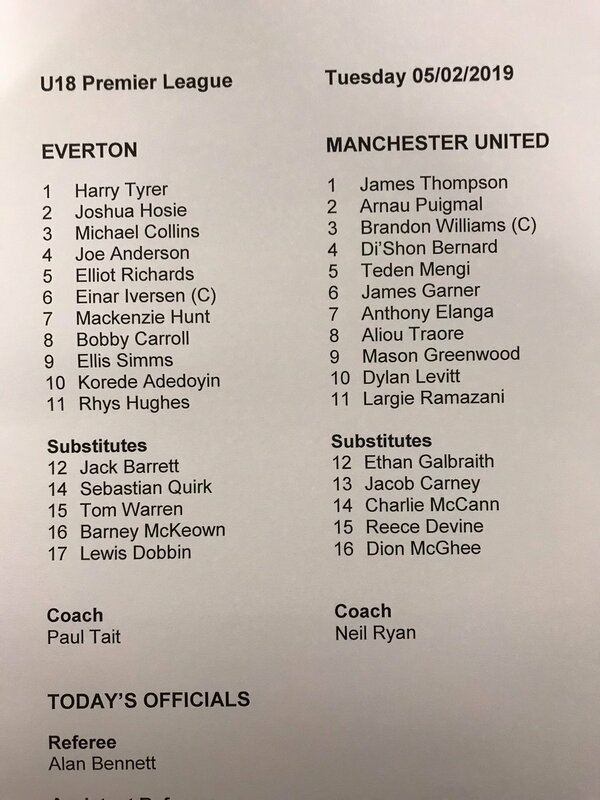 Everton U18s: Tyrer, Hosie [R:25'], Collins, Joe Anderson, Richards, Iversen, Hunt, Carroll (83' McKeown), Simms, Adedoyin (76' Quirk), Hughes (68' Warren). Subs not Used: Barrett, Dobbin. 5' First chance of the game falls the way of Everton - but Korede Adedoyin‘s effort is blocked by Brandon Williams. 18' Adedoyin goes close again, this time dragging a shot wide from the edge of the box. 24' Mackenzie Hunt forces Thompson into another save, after the winger collected Bobby Carroll's pass. 25' Everton are down to 10 men after Josh Hosie is shown a straight red for a late tackle on Ramazani... And from the resulting free-kick United's Di'Shon Bernard heads against the bar. 26' United again denied by the bar. Good work down the right sees Arnau Puigaml pull the back to Traore, whose effort rattles of the crossbar. 37' United sub Arnau Puigmal is replaced by Charlie McCann. 39' Mason Greenwood denied by Harry Tyrer in the Everton goal. Unite been on top since the young Blues were reduced to 10 men. 49' Great block from Elliot Richards denies United an almost certain goal. While at the other end, the young Blues have a penalty appeal waved away after Adedoyin is tripped by Bernard. 56' Great turn of pace from Ramazani seas the winger escape the challenge of Einar Iversen before his effort is saved by Tyrer. 60' United go close again. This time Ramazani fires over from close-range after some footwork by Greenwood in the build up. 68' Everton sub: Rhys Hughes replaced by Tom Warren. 75' United now a penalty appeal of their waved away after Anthony Elanga goes down under Iverson's challenge. 76' Everton sub: Seb Quirk is on for Korede Adedoyin. 76' United really piling on the pressure as both Richards and Michael Collins block efforts in quick succession. 79' So close for Man Utd. Elanga advances down the right before crossing for the unmarked Greenwood - but the forward somehow hits the crossbar from 6 yards out. 83 Third and final sub for Everton as Bobby Carroll is replaced by Barney McKeown. 85 Penalty United. Greenwood is brought down by Collins. Dylan Levitt coolly dispatches the spot-kick 0-1. 87 United sub: Ramazani is replaced by Ethan Galbraith. 90 United sub: Levitt is replaced by Dion McHee. Thanks for the reports Michael. Is Greenwood the United player the lad who is very highly rated at Old Trafford? Dave, yes Mason Greenwood is pretty special for his age, think he's a 1st-year Scholar so about 17, made a real breakthrough last season as a Schoolboy. He's scored some cracking goals for their U18 and U19s European side. It'll be interesting to see how they handle him as their U23s side is not very good and plays in the 2nd Division, ie, below our U23s, so in some ways, their U18s are playing a better standard. Phill (5), thanks Phill, Ive read that some United fans want him to have a game with the first team so maybe he is a bit special.